Austech External Building Products has added DuraPlank external weatherboard to its range of vinyl cladding, with a sleek modern contour that creates clean lines and a deep shadow. Cinajus recently installed Midland Blue limestone pavers for a private residential project in Hyde Park, Townsville, Queensland. Dalsouple Australasia manufactures rubber floor tiles in an almost unlimited range of colour and in more than 30 textures. Pattons Awnings has launched outdoor acoustic barriers that act as an effective and aesthetically pleasing way of limiting sound movement from areas such as pools, spas and outdoor dining areas. The Meeting Place heritage building in South Fremantle has been upgraded to demonstrate a sustainable retrofit. 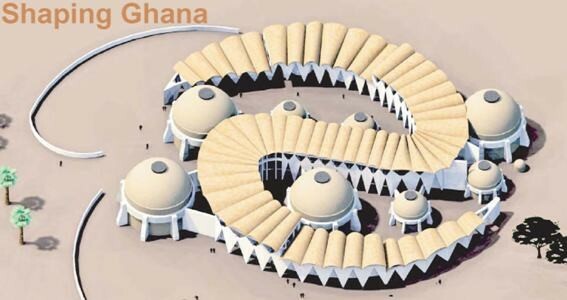 Giuseppe Calabrese from Australia took second prize in the competition with the design Gye Nyame, beating entries from over 30 countries. The Queensland property industry has rallied behind fund raising efforts for the Premier's Disaster Relief Appeal, with a benefit on 17 February. Available from Sunteca, Markilux Pergola 200 conservatory awnings provide large area sun protection for patios. Axiom Design provides glass and aluminium balustrades that are specially formulated to offer an economical yet architectural balustrade option to projects. There is a duty of care on employers to ensure the health, safety and welfare at work of all employees and others who come on to the workplace. This includes asbestos risks. Steel framing has been selected for an impressive new pop-up design installation and waste-free cafe – ‘Greenhouse’ – that showcases recyclability and sustainable living. Australian bathroom and kitchen brands Caroma, Fowler, Dorf and Clark recently played a key part in the successful reality television program ‘From The Ground Up’.